In recent decades, epigenetics has been shown to be a promising field of research, since it describes changes in inheritance patterns that do not involve DNA modifications and are related to interactions between the organism and the environment. Epigenetic marks are chemical changes that occur in chromosomes and result in the silencing or activation of specific genes in different tissues. It has been observed that new epigenetic marks may arise as a result of environmental changes, and may be perpetuated for many generations. The existence of inheritable non-genetic effects that have a direct influence on the phenotype provides an additional mechanism of variability which helps us to understand the origin of present biodiversity. Epigenetic effects are clearly perceptible when the parameter analyzed is diet. In addition to influencing the phenotype of an individual, diet can modulate the offspring phenotype. In placental mammals, for example, maternal effects related to diet are expected, given the sharing of blood supply between the mother and her offspring. However, the embryonic development of invertebrates is largely independent from the mother and the uterine environment after fertilization. Therefore, the presence of maternal effects in invertebrate offspring due to maternal diet habits is particularly intriguing . Maternal effects of nutrient availability have already been observed in some invertebrates such as Drosophila  and Caenorhabditis elegans . In this article, special attention will be paid to studies of maternal epigenetic effects that use C. elegans as a model. The nematode C. elegans was initially isolated and described by the zoologist Émile Maupas in the earliest 1900´s. Due to its unique morphological and physiological features, this species has been used as a model organism for several research areas and was employed in seminal studies which were awarded with Nobel Prizes in 2002, 2006 and 2008 . Studies evaluating diet-related epigenetic inheritance in C. elegans have focused on the insulin pathway and have shown that it affects processes related to development, aging, metabolism and resistance to stress . Alterations in this pathway may be related to maternal effects on the phenotypic plasticity of C. elegans offspring. In this context, Hibshman and colleagues  demonstrated that the C. elegans progeny submitted to caloric restriction are protected against larval starvation, growing more rapidly than worms that were given normal amounts of food. They also demonstrated that maternal insulin-like signaling regulates oocyte provision in response to nutrient availability. Epigenetic reprogramming of the insulin pathway involves the development of an “economic phenotype,” which is related to a greater accumulation of fat resulting from nutrient rationing. Under normal conditions, this fat accumulation is harmful to the organism, but can be extremely positive if the offspring has to undergo the same stressful situations as its parents, making it better equipped to cope with the stress . Interestingly, there is a common regulatory network that controls progeny nutrition during embryonic development, progeny size and longevity in C. elegans. Therefore, changes in caloric intake have pleiotropic effects on C. elegans, resulting in the simultaneous modulation of several physiological and metabolic aspects that may result in changes of size, reproductive potential and longevity over a few generations. According to Hibshman and coworkers , the intergenerational and potentially adaptive function of insulin-like signaling found in C. elegans is not restricted to this nematode but can be verified in many other organisms. In addition to diet, an epigenetic inheritance related to temperature has also been observed in C. elegans. Klosin and colleagues , for example, have demonstrated that modifications in the expression of C. elegans heterochromatic genes induced by a temperature increase can last 14 generations. Thus, we can state that variations in food availability and temperature can generate an epigenetic memory that perpetuates for many generations , ). The epigenetic inheritance exemplified by studies of C. elegans shows that the Lamarckian logic, which states that an organism is able to adapt to the environment and pass these adaptations to the offspring, may, within limits, be used to explain microevolutionary processes. Taken together with the occurrence of mutations in populations and processes such as natural selection and genetic drift, the epigenetic heritage could explain the origin of vast biodiversity over a few generations. Some epigenetic changes may even result in the onset of mutations, which would corroborate the relevance of transgenerational epigenetics for the understanding of microevolutionary processes . The mutagenicity of 5-methylcytosines, for example, is 10-fold greater than that of unmethylated cytosines . Therefore, changes in environmental conditions and food availability could generate maternal transcriptional and translational pleiotropic effects transmitted from ancestral to modern strains. Populations of each of these ancestral lineages could have been isolated from each other and populated distinct niches, which would result in the emergence of a wide variety of distinct phenotypes over a few generations. The different challenges faced by these lineages could have resulted in the emergence of populations with extraordinary survival strategies as observed, for example, in the dauer larvae of C. elegans (Fig. 1). In this strategy, C. elegans L1 larvae which are faced with stressful situations (e.g., high population density, high temperatures and low food availability) enter into an alternative stage of development known as a dauer larva. At this stage, the larva is able to tolerate desiccation, entering into a state of suspended animation (ametabolic) known as anhydrobiosis. During suspended animation, C. elegans is able to withstand extreme conditions in temperature , radiation  and gravitational acceleration  (Fig. 2). 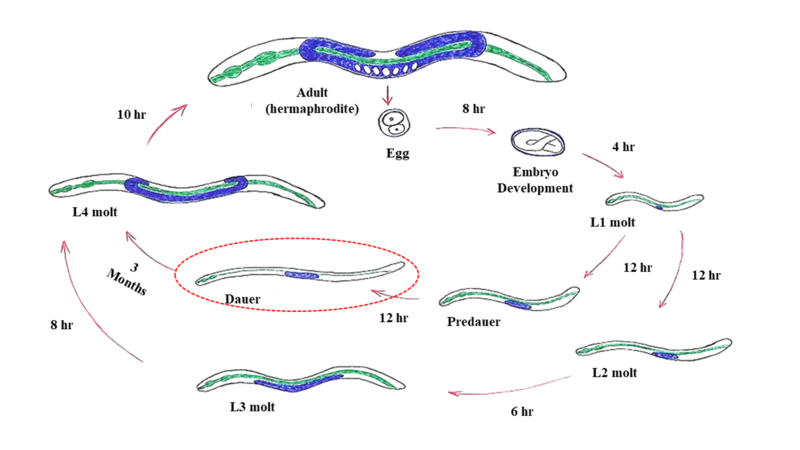 Other nematodes very similar to C. elegans are holo-anhydrobiotic, that is, all stages of these worms are able to enter into suspended animation when desiccated (Figure 2). Among them, we can mention Panagrolaimus superbus, which belongs to the same order (Rhabditida) as C. elegans, and shares incredible similarities with that species. 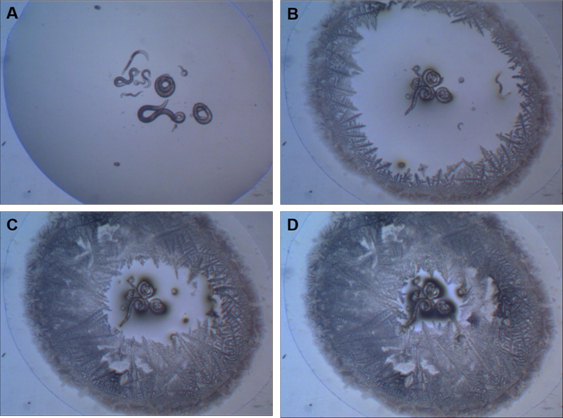 Recently, Souza and Pereira  showed that desiccated P. superbus worms can also withstand extremely low temperature (-196°C) and high radiation doses (500 Gy of X radiation). Resistance of nematodes to stressful conditions may be related to past epigenetic changes over many generations. We may suppose that ancestral lineages subjected to successive stress conditions over generations resulted in a wide variety of organisms with distinct genomes and mechanisms of stress resistance. In order to understand how epigenetic changes caused by stressful situations can shape the organism’s genomic structure, consider another nematode species close to C. elegans, C. briggae. Many similarities between these worms point to common ancestry. C. briggae and C. elegans have the same number of chromosomes (6) and the same approximate number of coding genes (19,500) . However, the genome of C. briggae has 104 Mbp while the genome of C. elegans has only 100.3 Mbp. The size difference between these genomes is due to the greater amount of repetitive DNA in C. briggae . Interestingly, epigenetic modifications can cause the contraction or expansion of repetitive DNA. Regulation of CpG islands methylation, for example, can modulate the number of repetitive regions, increasing the rate of evolution and leading to morphological changes after few generations. Given the relationship between the methylation pattern of genes and stressful conditions, the evolutionary rate would be increased in situations such as starvation . Therefore, epigenetic inheritance related to stressful conditions could explain both the emergence of resistance strategies and the rise of genomic structure alterations, which could result in drastic morphological changes over few generations . In this context, studies of epigenetic inheritance patterns in C. elegans should be encouraged in order to gain a better understanding of the microevolutionary processes responsible for current biodiversity. Tiago Alves Jorge de Souza, PhD. Rando, O.J, Simmons, R. A. 2015. I’m Eating for Two: Parental Dietary Effects on Offspring Metabolism. Cell. Elsevier Inc.161: 93–105. Matzkin, L. M., Johnson, S., Paight, C., Markow, T. 2013. Preadult parental diet affects offspring development and metabolism in Drosophila melanogaster. PLoS One8: e59530. Frazier, H. N., Roth, M. B. 2009. Adaptive sugar provisioning controls survival of C. elegans embryos in adverse environments. Current Biology 19: 859–63. de Souza T. A., Pereira, T. C. 2018. Caenorhabditis elegans Tolerates Hyperaccelerations up to 400,000 x g. Astrobiology 18(7):825-833. Murphy, C. T., Hu, P. J. 2013. Insulin/insulin-like growth factor signaling in C. elegans. WormBook. 1–43. Hibshman, J. D., Hung, A,, Baugh, L. R. 2016. Maternal Diet and Insulin-Like Signaling Control Intergenerational Plasticity of Progeny Size and Starvation Resistance. PLoS Genetics 12(10):e1006396. Klosin, A., Casas, E., Hidalgo-Carcedo, C., Vavouri, T., Lehner, B. 2017. Transgenerational transmission of environmental information in C. elegans. Science; 356(6335):320-323. You, J. S., Jones, P. A. 2012. Cancer genetics and epigenetics: two sides of the same coin? Cancer Cell 22(1):9-20. Rakyan, V., Whitelaw, E. 2003. Transgenerational epigenetic inheritance. Current Biology; 8;13(1):R6. Ujisawa, T., Ohta, A., Okahata, M., Sonoda, S., Kuhara, A. 2014.Cold tolerance assay for studying cultivation-temperature-dependent cold habituation in C. elegans. Protocol Exchange. Onodera, A., Yanase, S., Ishii, T., Yasuda, K., Miyazawa, M., Hartman, P. S., Ishii, N. 2010. Post-dauer life span of Caenorhabditis elegans dauer larvae can be modified by X-irradiation. Journal of Radiation Research 51 (1): 67-71. Souza, T. A. J., Carli, G. J. and Pereira, T. C. 2017. Survival potential of the anhydrobiotic nematode Panagrolaimus superbus submitted to extreme abiotic stresses. Invertebrate Survival Journal 14: 85-93. Stein, L. D., et al. 2003. The Genome Sequence of Caenorhabditis briggsae: A Platform for Comparative Genomics. PLoS Biol. 1(2): e45. Ruden, D. M.; Garfinkel, M. D., Xiao, L., Lu, X. 2005. Epigenetic Regulation of Trinucleotide Repeat Expansions and Contractions and the “Biased Embryos” Hypothesis for Rapid Morphological Evolution. Current Genomics 6:3.